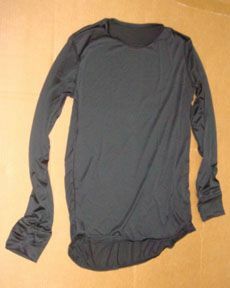 The undershirt has a crew neck, contoured longer tail in back and long sleeves with a thumbhole (to aid in donning as well as adding additional protection to the hand/wrist area). The drawers have an elastic waistband and access fly. All joining seams are flat locked construction to reduce chaffing and comfort in movement. The undershirt and the drawers are fabricated in 100% polyester circular knit plaited jersey, Polartec Power Dry style 9023 that dimensionally wicks moisture/perspiration away from the body. The fabric weighs 3.6 ± 0.4 ounces per square yard.